I came across a sister who tats lace altar cloths. Many people ask me if what I do is tatting because my thread is fine, and crochet thread is often yarn weight. 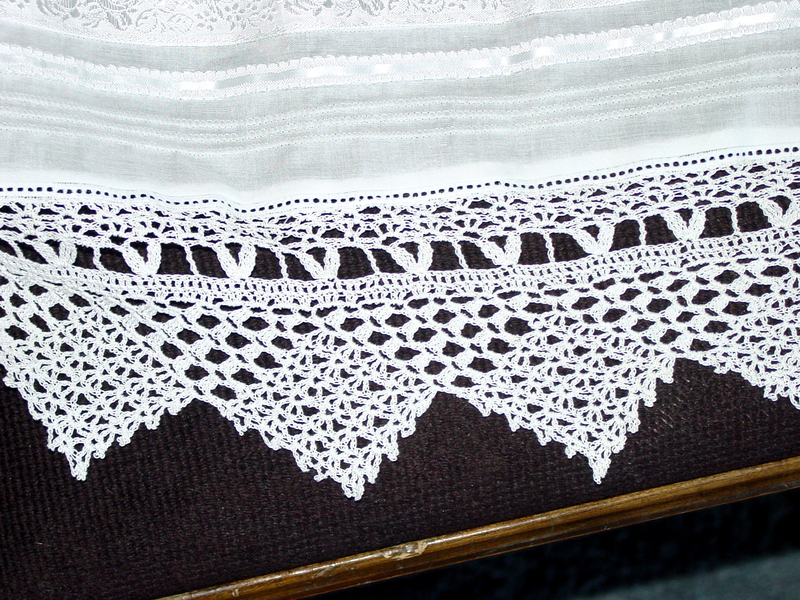 My lace is almost all crochet, but there are sisters who still tat altar cloths for the Lord. It all started when I was 13 years old. I had appendicitis and while I was in the hospital I shared a room with an older lady. She was tatting almost constantly and I liked the look of it. I was so intrigued that I decided I wanted to learn to tat someday. Three years later (while I was 16) it was 1980 and we were celebrating the sesquicentennial of the organization of the church. The young women’s leaders in my ward decided that they wanted us girls to learn something new as part of that celebration year. I told them I wanted to learn tatting. So, they found an older sister in the ward named Ruby who knew how to tat. Three of us went to Ruby’s house to learn. I tied knots for about 30 minutes and then it clicked, and I was tatting. I started out with simple projects such as bookmarkers, and enjoyed the time I spent visiting Ruby and developing a friendship with her. I still have a pansy doily she crocheted. It has always been on display somewhere in my house since the day she gave it to me. After about nine years, my sister asked if I could tat a baby bonnet. She picked the pattern, and I gave it a try. Up to that point I had never done anything that big. I ended up making a bonnet and matching set of booties, and the rest is history. So far I have made numerous Christmas tree ornaments and bookmarks, about 10 bonnets and a number of doilies. I am currently working on an altar cloth for the Boise Idaho Temple. Many years ago, it used to be the case in the Denver Temple, that they would only accept tatted altar lace. 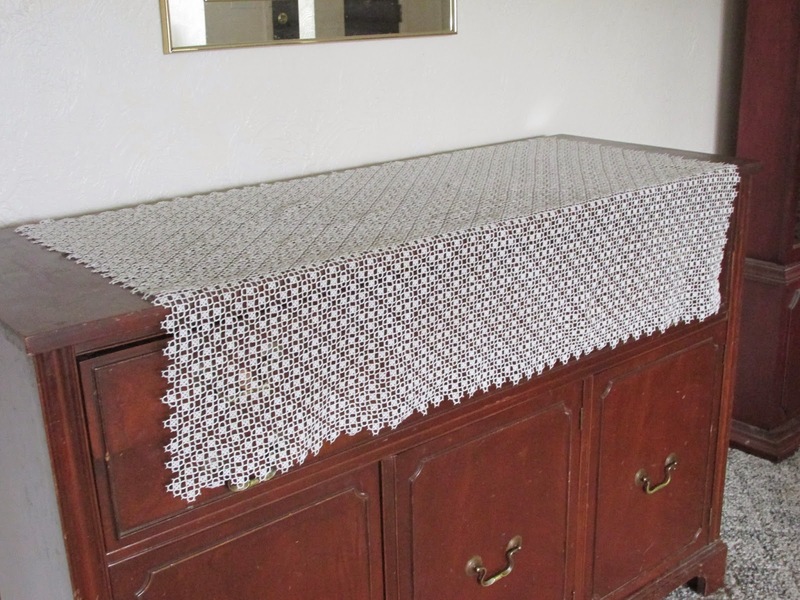 Lacemakers who tat have become so rare that they now accept crochet altar cloths also. The standard is the best. Whatever we can give, that is the best we can give, that is what is asked of us. I love the history. The thing about tatting is that it is almost a lost art. Few people know how to do it anymore, but it is so delicate and beautiful. I’ve also learned that you can’t get enough money to make it worth the work. So, I never sell my tatting. I only give it away. 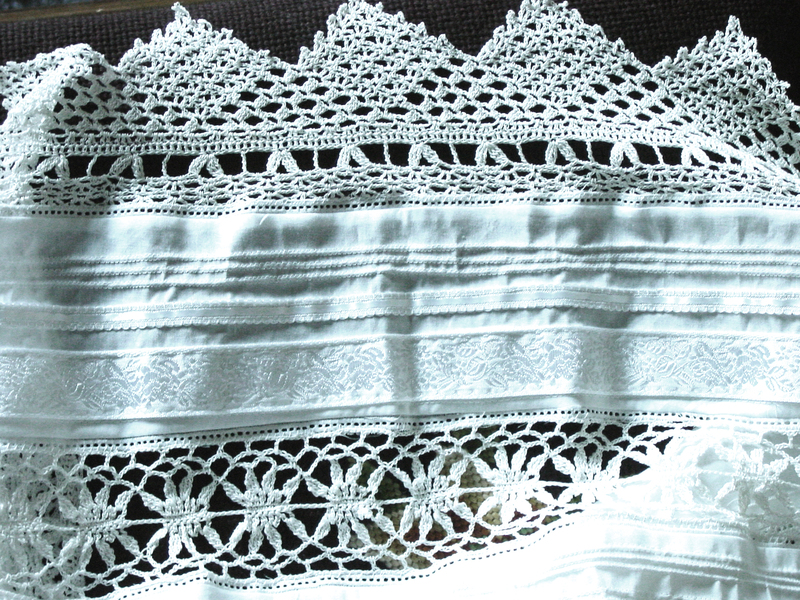 Ann has posted pictures of the construction of this lace also, so you can see how a tatted lace is put together. This one was made in size 30 thread, and now sits in the Boise, Idaho Temple. What a gift. 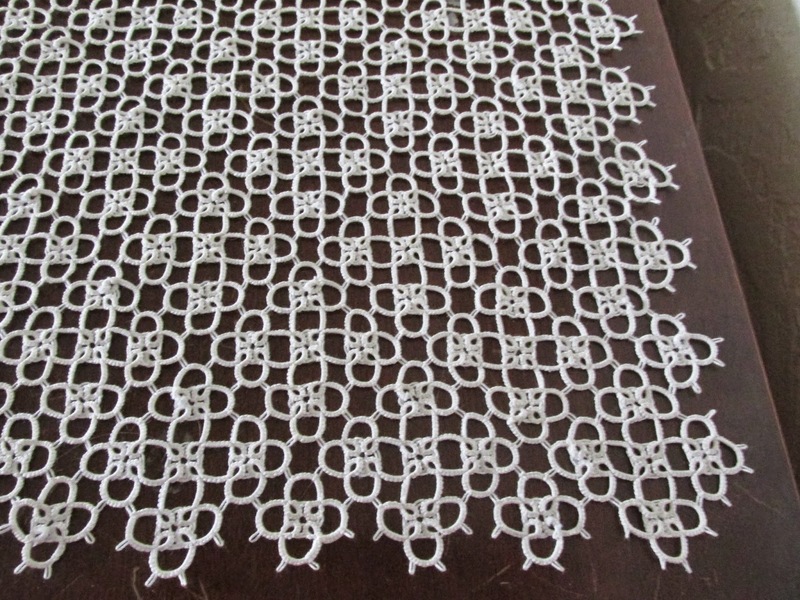 “This altar lace has 527 larger motifs and 64 smaller ones around the edge. The large motifs took up to one hour each to make. The smaller ones took about 15 minutes each. All of them (591) had to have the ends whip stitched to hide them. All in all, I would guess I spent over 600 hours on it. The motifs line up in diagonal lines across the altar which creates an optical illusion with the angles of the altar. The motifs themselves move in and out in a way that I find very pleasing. I took this picture today just before I went home. 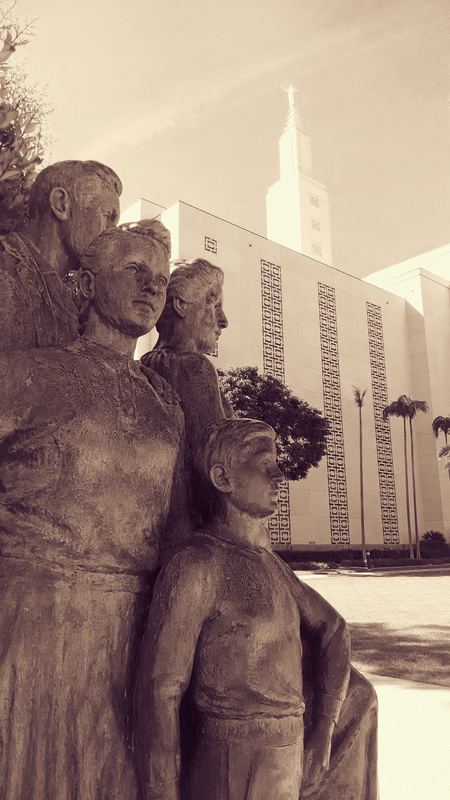 I have always loved this statue of a family at the Los Angeles Temple. It is a beautiful, timeless reminder of what it’s all about. When I was working with our temple matron a few weeks ago, she paused right in the middle of the laundry area– we were up to our eyeballs in lace, pins and measuring tape, all the washing machines were humming and six other ladies were working on the various stages of cleaning, steaming and pressing, categorizing and folding everything that needed to be cleaned down in the laundry. In addition to all the baptistry laundering, and endowment laundry, they’d just had a wedding party come through the weekend before with 72 guests. At the last minute, the bride decided she wanted her ceremony to be all white, so everyone rented the clothes and things they needed for the ceremony, creating quite a bustle for the laundry for several days afterward. Every bit of everything that has to be done to have that happen, has to be done anew, and perfectly. Two of the women she introduced to me there had been working in the temple laundry for more than 35 years. Every day. As we examined each altar lace, we noticed some were marked on the back with handwritten tags telling the name of the person who had made each of the older laces, and which altars that lace used to fit. We noticed that some of the tags had E-1,2 written on them, or Endowment room one and two, which was perplexing because endowment rooms one and two do not have altars. Martha, the woman in the laundry who had been there the longest (39 years) explained that there was a time when there were altars in those two rooms. Most of the women whose names are on the laces are gone now. So much history and sacrifice there. In the original text he was speaking of the price of freedom, which for them, was steep. Part of the price his generation paid, and many generations before him paid, enabled us to have our temple. If knowledge is freedom, and it is, I suppose that is what the temple is about also. Mortality seems to have this struggle as a theme, and the culminating fruits of that struggle are there, in those walls. It is amazing what we are tempted to take for granted. I suppose that is the reason for the work, to give us an inkling of the price and the value of what is there for us to become. 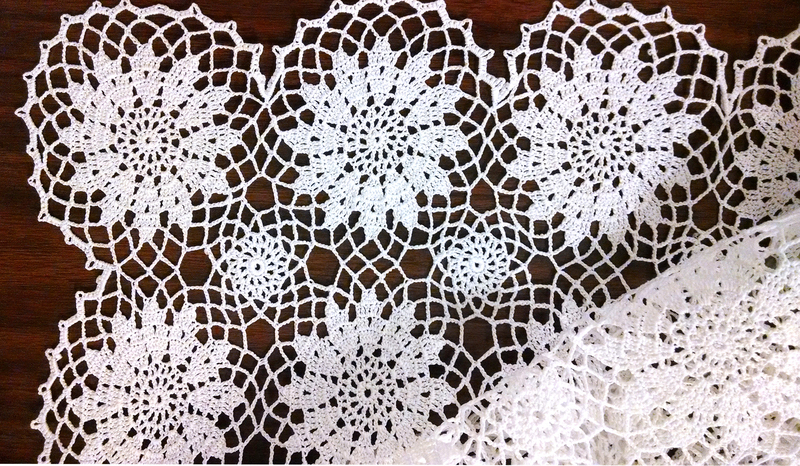 Crochet Altar Cloth Lace– with repeating motifs. Each temple is responsible for their own lace altar cloth collections. If you would like to make an altar cloth, call your local temple and make an appointment to speak with the matron to find out what your temple’s altar cloth needs are. She will be able to give you the instruction and guidelines you need for the sizes of altar cloths she needs. If you have questions about how to create, block, whiten, or anything else regarding care for crochet lace, drop me a note, I’m happy to assist. 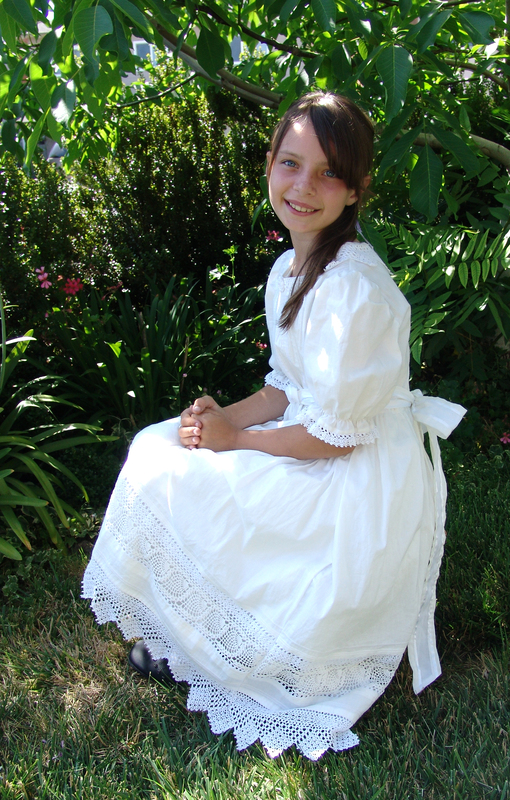 We have an amazing community of lacemakers in our LDS culture. It’s a wonderful heritage I hope to see flourish for a good long time. Anyone can make lace. It’s a skill more than a talent. It just takes practice. If you are working on a temple lace, send me a picture of your lace pattern! I’d love to feature more LDS Lacemakers! You know it’s going to be a good day at the temple when there’s a line of twenty people trying to get in for the first session at O dark thirty in the morning. Who knew the 5:30 session was so popular? I love this place. I took this picture from the rose garden out front before I went home. The buds are just beginning to bloom. I couldn’t resist. 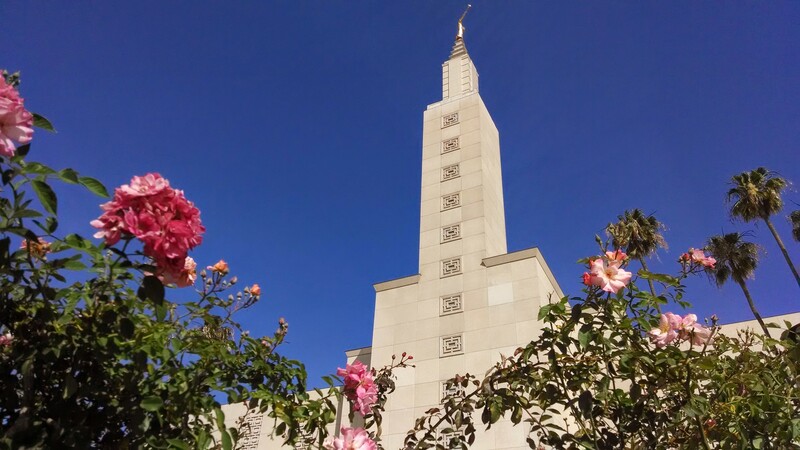 The Los Angeles Temple, from the rose garden. When I began working with the Los Angeles Temple, the Temple Matron and I had quite a few questions about what kinds of laces and designs were acceptable for altar cloths, since we were both unfamiliar with the new guidelines. We ended up talking with Salt Lake several times. 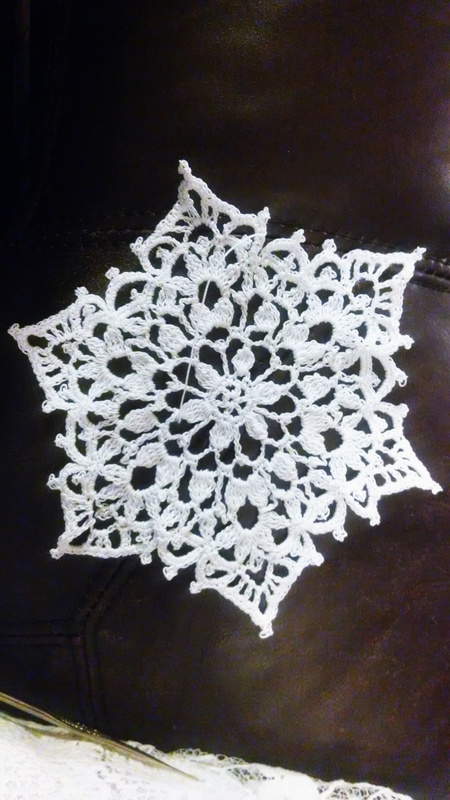 When the Temple Department found out I was making new laces, they told me there was an urgent need for an altar lace in the Denver Temple, and wondered if I could help. I already had a lace I was working on for the Los Angeles Temple so I couldn’t help with Denver, but I knew someone who could. I gave them the contact information for my mother-in-law and sister-in-law, Mary and Heather Rockwood. They are also lacemakers, and they both happen to live in Colorado, just south of Denver. It turned out that even though Heather has never made altar lace before, she was already working on an altar lace for them… the temple in Denver just didn’t know it yet. Slow and steady, she already had quite a few inches of her lace completed. How is that for being inspired? They were so pleased. 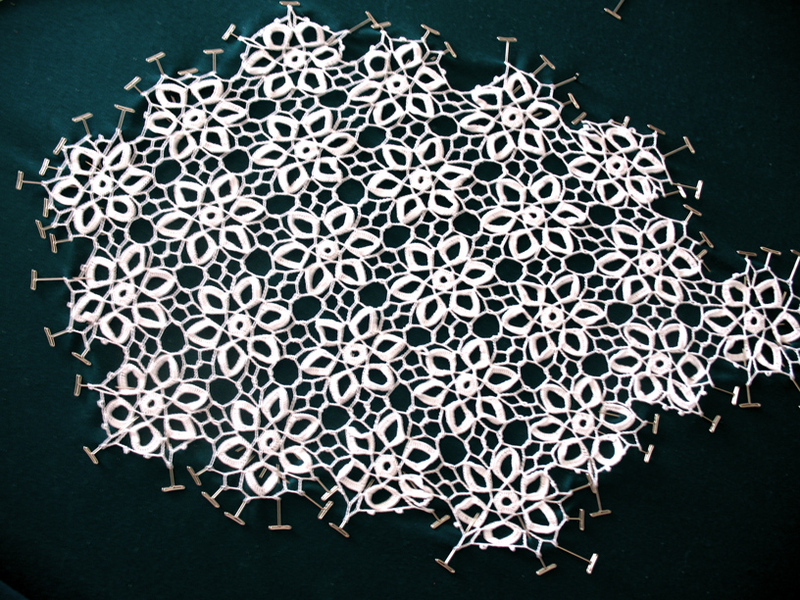 I asked Heather what pattern she was using, and she sent me this photograph of her lace in progress. It’s simple and beautiful. 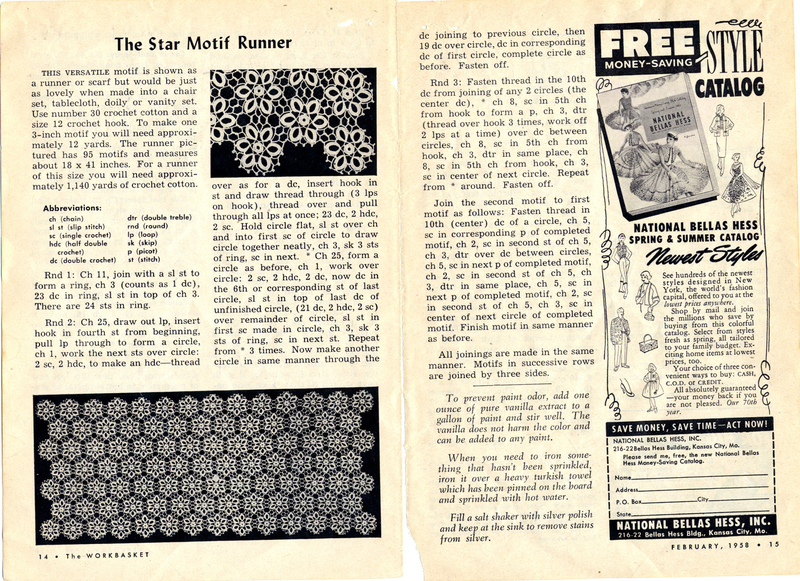 Her pattern is called “Star Motif” from an old needlework magazine called “Workbasket”. 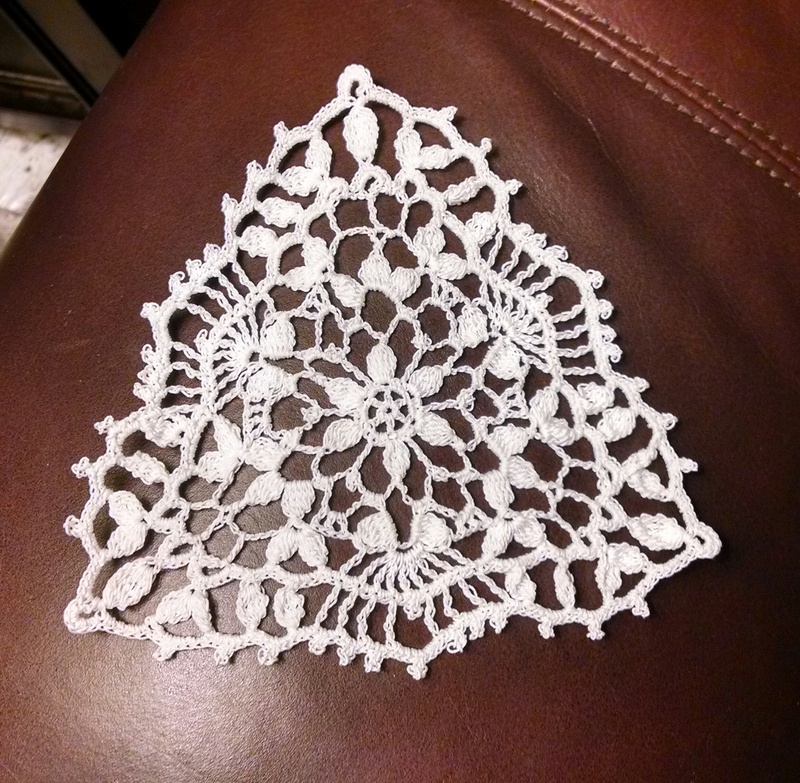 Mary has also started working on an altar lace for the Denver Temple. This will be her second altar lace. 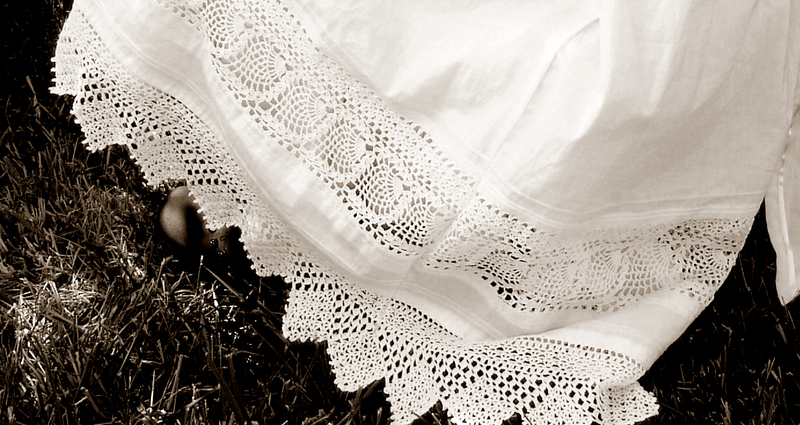 I wrote a post about her first lace for Denver Temple that she made several years ago. 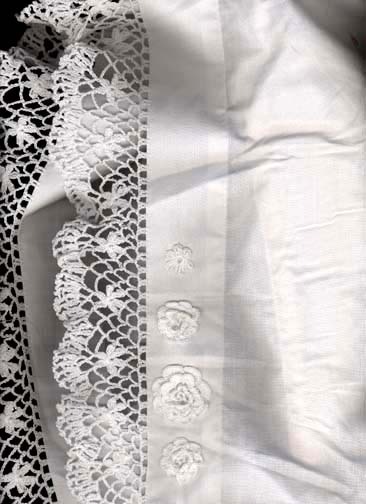 Her new altar cloth is going to be the sister lace to my Ebenezer Lace. I taught Mary the pattern when she visited me a month or two ago, and she decided to make hers to match. So, when they are finished, Denver will have two new laces, instead of one!